Sergei Gonchar's back caused him enough pain in Game 5 to consider packing it in, but instead he persevered to come back and play a vital role in the Penguins triple-OT 4-3 win over Detroit. DETROIT -- According to Penguins defenseman Brooks Orpik, his defense partner, Sergei Gonchar, had his street clothes on and his bags packed when the Penguins came back into the dressing room after the second overtime. "His bag was packed. I sit right next to him," Orpik said. "They went to him and said 'Could you just try and go. Just try it.' It's a gutsy effort by him." Gonchar, though, said he told Penguins coach Michel Therrien when the team came in after the second OT that his back spasms had subsided and he could go out there and play a power play if the Penguins were fortunate enough to get one. Gonchar got dressed and was on the bench for the start of the third extra period. He was on the ice for Petr Sykora's game-winning power-play goal. 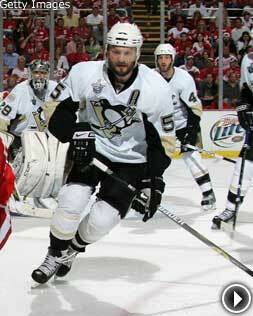 "I started feeling better and that's why I came back," Gonchar said. "My spasms in my back were so tight that I couldn't breathe. They started loosening up. Our trainers were working on me for such a long time and it started paying off. At the start of the third overtime I told coach there is a chance I could come back." There will be blood -- When Jiri Hudler's high stick caught Rob Scuderi in the face 9:21 into the third overtime, the Penguin defenseman said all he could think about was if there was blood or not. If Scuderi was cut and bleeding, Hudler's high-sticking penalty would go from two minutes to four minutes. "I was just praying for blood," Scuderi said. "You're skating off the ice and thinking 'God, I hope I'm bleeding.' "
He was and Hudler was exiled to the penalty box. Thirty-six seconds later, Sykora ended the game with his short-sided shot from the right circle. But Scuderi also knows that Hudler's penalty would never have occurred if he didn't fan on the puck. When he did, Hudler came at him and got the stick up. "I didn't want to go into the middle with it because they were shutting down the middle," Scuderi said. "I tried to make a move and ended up fanning on it. I was grateful for the high stick and happy with the four minutes." Who, me? -- Maxime Talbot was shocked when Therrien gave him the nod to be the Penguins' extra attacker late in the third period when goalie Marc-Andre Fleury was summoned to the bench. Talbot had never been the extra attacker before Monday night. He ended up whacking the tying goal by Chris Osgood 52 seconds into his shift. "I was kind of surprised when Therrien called it because it's a gutsy move by him," Talbot said. "With the talent and skill in this dressing room he calls my name as the sixth guy for the goalie? I was just in the right place at the right moment." It's not as if Talbot doesn't have a history of scoring goals. He was a big-time scorer during his junior days in the QMJHL when he scored 101 goals over four seasons, including 46 in his third year in the league in 2002-03. "Coaches get feelings sometimes," Therrien said. "It doesn't work all the time, but I love Talbot's game. He was on the puck. He's got a lot of energy. And, one thing you know is you want to put the puck at the net, and he is always around the net. "Honestly, it was more than a feeling than anything." We've got more -- After playing 109 minutes and 57 seconds of grueling, intense, no-tomorrow hockey, one would wonder if the Penguins have enough left in their proverbial tank to summon a similar gutsy performance in Game 6 Wednesday night. After all, Game 6 is all that matters now as they still face elimination. "If we had enough juice to play this long," Scuderi said, "I don't think Game 6 is going to be a problem." Hurts So Good -- The Stanley Cup Final has not been kind to the body of Pittsburgh's Ryan Malone. In Game 1, he was walloped by an open-ice hit from Detroit defenseman Niklas Kronwall, breaking his nose. Monday night, in Game 5, Malone saw a Hal Gill slap shot tick off Detroit's Dallas Drake and catch him flush in the face. Malone crumpled to the ground, gloves flying off as he began bleeding profusely from a gash just to the right of his broken nose. "I just got five (stitches) and I chipped a couple of teeth," said Malone. "It could have been worse. I broke my jaw before; so, knock on wood, I could have come out worse." Instead, he went in for repairs and returned to the action in record time. He was rewarded for his perseverance in the third OT, on the ice for Pittsburgh's winning goal. Malone, as usual, was parked in front of the net -- very close to the spot where he got drilled by the Gill shot four periods earlier -- screening Osgood as Sykora ripped a wrister short side. "I was trying to get to the front of the net," Malone said. "It was kind of a broken play and I was just trying to create some havoc there. Sykie picked the corner. It was nice watching it go in, that's for sure." Pesky Pens -- While some may have been under the impression that the Pittsburgh Penguins were finished after losing Game 4, they certainly showed otherwise in Game 5 at Joe Louis Arena. With Sykora's goal in triple overtime, the series now shifts back to Pittsburgh Wednesday night, which gives the Red Wings less than 48 hours to shake off their most crushing loss in quite some time. "We knew they weren't going away," Kronwall said. "We just have to bring whatever we did good and stay confident. No one said it was going to be easy. It's disappointing right now, but we're going to be ready to go. Another one for the road team -- Pittsburgh's 4-3 triple-overtime victory over Detroit in Game 5 was the fifth-longest in Stanley Cup Final history -- and all five games have been won by the visiting team. Detroit has been involved in two of the five games. The Wings beat Carolina 3-2 in Game 3 of the 2002 Final on Igor Larionov's goal at 54:47 of overtime. Petr Sykora's goal at 49:57 on Monday night kept the Penguins alive. The longest game in Final history was Edmonton's 3-2 win at Boston in Game 1 of the 1990 Final. Petr Klima scored the game-winner at 55:13 of overtime. Dallas' 2-1 win over Buffalo on June 19, 1999, missed breaking the record by 23 seconds. Brett Hull's goal at 54:51 of OT in Game 6 was the latest ever to decide a Stanley Cup. Get your Ryan Malone jersey now! It worked -- Talbot's game-tying goal with 35 seconds left in regulation was one of a kind -- it was the first time in 101 games in the regular season and the playoffs that the Penguins had scored to tie the game after pulling the goaltender. The Red Wings had allowed only one sixth-attacker goal all season, a power-play goal by Edmonton on Feb. 26 in a game the Oilers wound up winning 4-3 in a shootout. Overtime nightmares -- The Red Wings have never been a great overtime team at home. The Wings' 4-3 loss to Pittsburgh dropped their all-time record in overtime in Detroit to 18-32, a .360 winning percentage. That includes a 2-1 win over Nashville in Game 5 of the opening round. The victory improved Pittsburgh's all-time overtime record in the playoffs to 17-14, including 11-9 on the road. Pittsburgh also improved to 18-15 all-time in Game 5 of playoff series. The Wings fell to 33-36. One good omen for the Penguins as they prepare for Game 6 -- they've won six of nine Game 6s at home.